Choose hard, smooth surface floors that are easy to clean. 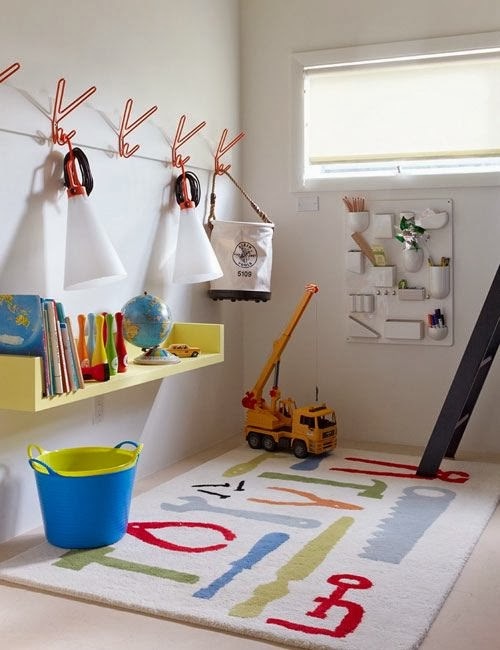 Kids play primarily on the floor, so make it a healthy material like solid wood, bamboo, cork, and linoleum. If glues or finishes are required, choose ones that do not contain VOCs (volatile organic compounds) and follow directions carefully. Choose area rugs made of natural materials like wool or jute instead of wall-to-wall carpet. When painting, take precautions if lead-based paint is present, and choose low or no-VOC paint. Protect indoor air quality with safer painting products, and protect your family from any lead dust exposure by using appropriate containment and surface prep methods. Choose durable, low-toxic furnishings like solid wood furniture. Avoid particle-board products, typically made with urea-formaldehyde (UF) glues. Steer clear of stain-resistance (Teflon) treatments, and products embedded with antimicrobial chemicals such as Microban. Polyurethane foam may contain toxic flame retardants, so instead choose items stuffed with down, wool, cotton, or polyester. Avoid products containing PVC, such as inflatable furniture, artificial leather, PVC-coated fabrics, and vinyl furniture covers. Promote healthy indoor air in your play space and throughout your home. Keep pollution sources out by avoiding products like harsh cleaners, air fresheners, and pesticides. Use exhaust fans in bathrooms and kitchens to keep humidity low, and fix leaks to avoid mold and moisture issues. Open windows for fresh air when appropriate to increase ventilation. Use the right tools and tactics for safe cleaning. Clean without harmful chemicals using a HEPA vacuum, damp dust with microfiber or terry cloth rags, and try green cleaning recipes. If your family is generally healthy, the need for disinfecting and sanitizing products is rare. Routine cleaning with plain soap and water is an effective method for removing germs from surfaces. Avoid clutter so dust and dirt can be easily cleaned. Using closed containers for toys is a great way to minimize dust and clutter. Label bins and rotate them periodically from storage into the playroom to keep toys manageable and make old favorites “new” again. Choose plastic-free storage options such as solid wood toy chests and bins made of wicker, canvas, and cardboard. Select safer toys. Avoid toys with PVC (vinyl), a soft flexible plastic commonly found in bath and squeeze toys, inflatables, and dolls. Choose plastic-free toys when possible, especially for young children who frequently put them in their mouths. Look for toys made of unpainted wood, cloth dolls, plush toys, and games or puzzles made of paper. Encourage creativity with kid-safe art supplies. Children rarely use art products “as directed,” so make sure your art supplies don’t include harmful ingredients. Avoid solvent-based products like permanent and dry-erase markers, mists from sprays, and dust mixes from clays or paints, all of which are easily inhaled. The label “non-toxic” and the ACMI AP symbols indicate less toxic options, though they still are not always completely safe for kids.